Mary T. Carvino, 96, died April 5, 2019 at Hathorne Hill in Danvers, MA. 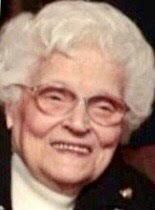 She was born December 11, 1922 in East Cambridge, MA, to Mary and Anthony Macedo, WWI Veteran. She lived in Somerville where she started her family, moved to West Peabody with her children, and resided in Georgetown, MA for the past 25+ years with her daughter Deborah Langlais, and grandchildren, Janelle and Robert Langlais. She was married to her beloved husband Anthony “Tony” Carvino, WWII veteran, for over 50 years, before he predeceased her in August 1999. She was predeceased by her son Richard Carvino, and daughter-in-law Leah Carvino. Survived by daughter Deborah Langlais of Georgetown, and her son James Carvino of Peabody, MA, daughter-in-law Laurie Carvino of Amesbury, MA, as well as her Ridgeway, Pennsylvania family, and her beloved 8 grandchildren: Richard Carvino, Lauren Haupt, Daniel Carvino, Leanne Carvino, James Carvino, Robert Langlais, Christina Carvino-Pimentel, and Janelle Langlais. Mary was also survived and very proud of her 10 great-grandchildren! Mary graduated from Bryant and Stratton college, became a secretary at a law firm, and was a stay-at-home mother to raise her children, then worked part-time at Ann & Hope in Danvers, MA. She was a past member of St. Adelaide’s Church in Peabody and St. Mary’s Church in Georgetown. She loved cooking, baking, playing bingo, and spending time with her family until her final day. Mary felt blessed to have such a wonderful, long life. Family and friends are invited to attend her Funeral Service on Saturday, April 13th at 11AM in the Conte - Giamberardino Funeral Home, 14 Pleasant Street, Georgetown. Interment will follow in Puritan Lawn Memorial Park, Peabody. Visitation will be prior to her service from 10 to 11. For those who wish, Mary may be remembered through donations, In lieu of flowers, to the compassionate care providers of Beacon Hospice/Palliative Care of Beverly, MA.